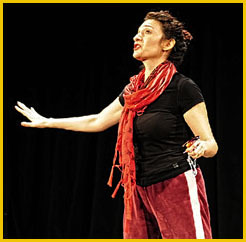 With Dirty Joke, Jennifer Blaine presents social commentary wrapped up in a comedy show. 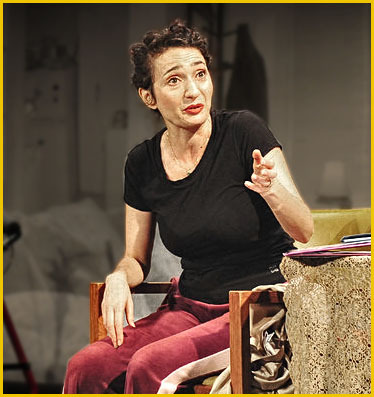 Appearing as her recurring character Ruth, a feisty old lady, she reels out a host of dirty jokes that would be right at home on the borscht belt. Ruth is all excited about the amazing Superwoman Conference, where, she reminds us, "We're using 'woman' to mean 'a person.'" That's one of her many zingers that are meant to make you think twice. Through this unifying context, Ruth introduces us to a string of real-life individuals who have dedicated their lives to improving the human condition, a few of whom are well known here in the U.S., like Madeline Albright and Arianna Huffington — others less so, such as Kiran Beth Sethi, an Indian educator, and Wangari Maathai, a Nobel Prize-winning Kenyan activist. Each is represented through deft impersonation by Blaine, who also occasionally breaks out in song, employing showtune melodies combined with her own crafty lyrics. One example: "That's Why Scalia is a Schmuck" (sung to the tune of "The Lady is a Tramp"). It's comedy with a conscience about very serious topics, but it doesn't feel preachy. Blaine is warm and thoughtful, never pushy or pedantic, and of course there's all those dirty jokes. And there's a sub-story line where Ruth embodies the ravages of old age, including ever declining physical infirmity and what looks to be impending Alzheimer's.